Untitled #1, 1976. mixed media on paper, 22 1/4 x 28 1/4 in. Untitled (Fishing Pray er), 1976. mixed media on paper, 21 3/4 x 21 3/4 in. Fish, 1976. Oil, wax on wood, 8 x 35 in. 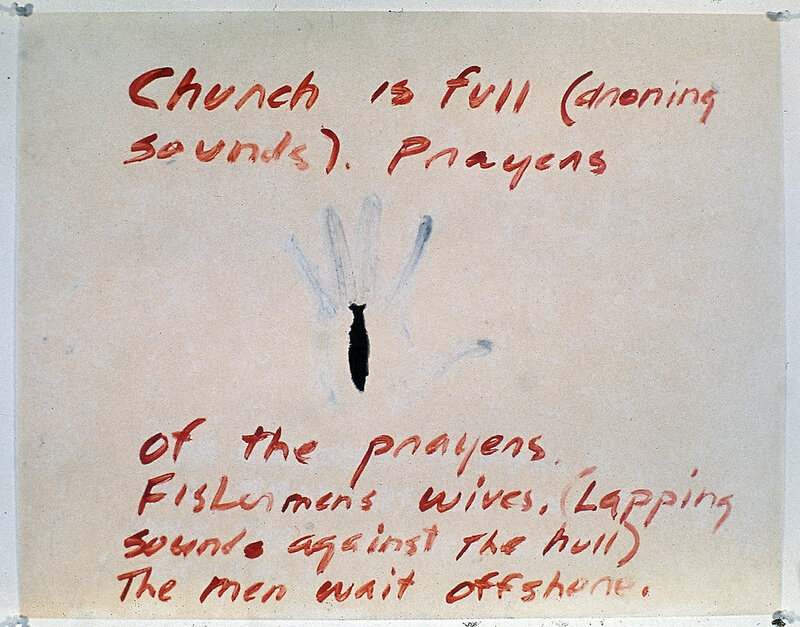 Fishing Prayer, 1976. crayon on oiled paper, 30 x 30 in. 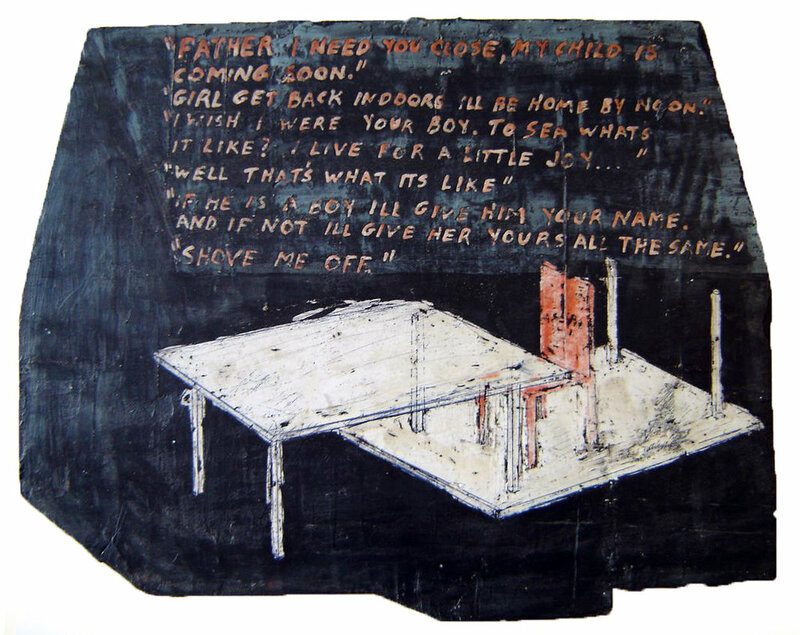 At the Back of the Throat where the Tongue Begins, 1976. oil and wax on plywood, 7 x 28 in. Frostbite, 1976. crayon and wax on oiled paper, 22 x 30 in. Mural Study (Bed and Sled), 1976. oil on board waxed, 15 1/2 x 19 1/2 in. Mural Study (Father/Daughter House), 1976. oil on board waxed, 15 1/2 x 19 1/2 in. Study for Boat and Tub. 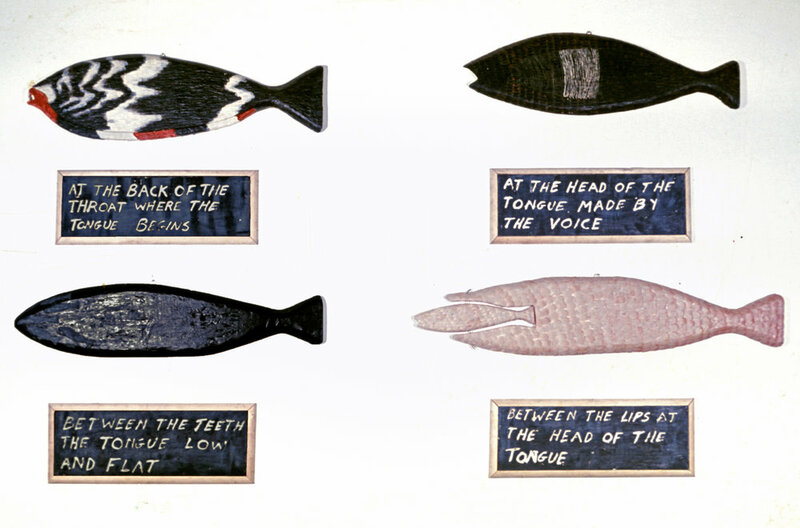 Maquette for Mural (Two sided), 1976. oil and beeswax on wood, 24 x 48 in. Reach Each Other, 1977. ink, wax and enamel on oiled paper, 3 sheets. 22 x 102 in. Transform, 1977. ink and oil on paper. 32 x 66 in. Protect Our Mother Savior, 1978. ink and oil on paper. 31 1/2 x 74 in. Sink or Swim (to Shore), 1978. mixed media on paper. 35 1/2 x 81 in. 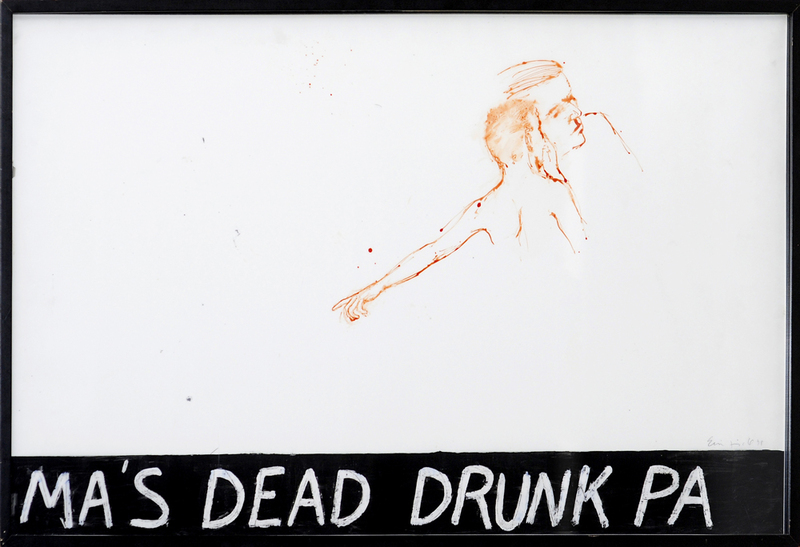 Ma's Dead Drunk Pa, 1978. watercolor and oil on paper. 24 x 40 in. A Trophy, 1978. tar and alkyd on plywood. 48 x 24 in.